Simian Skill International and National Training Institute (NTI) part of the Babcock International Group have joined forces in order to gain CISRS Overseas Scaffolder Training Scheme (OSTS) accreditation for a new centre in the Sultanate of Oman. 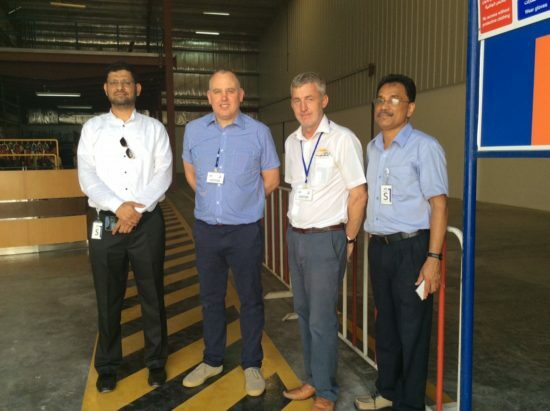 Following a pre-accreditation visit by the CISRS Manager Dave Mosley in April, Simian/NTI took the decision to source a new location for their new CISRS OSTS practical facility, which is adjacent to another of NTI’s training establishments in the Ghala Industrial Area of Muscat. “NTI Oman are proud to be working in association with Simian Skills and to become the first CISRS approved training centre in the capital (Muscat) which can offer scaffolding programmes that meet PDO’s revised criteria. We are committed to offering world class learning solutions to the Omani market,” said NTI Business Development Manager Mohammed Atif Uzzaman. The training centre is fitted out to a very high specification, Simian/NTI has gone to considerable expense to provide new materials and equipment for the centre audit which took place on 9th/10th of August. Newly fitted out air-conditioned classrooms and an on-site restaurant ensure that delegates will enjoy a very comfortable training experience. The investment in the facility has paid off as the centre has gained approval to deliver the following CISRS OSTS courses Level 1, Level 2, Basic Scaffold Inspection and Scaffolding Supervisor training. The first courses will be running in a matter of days, with a waiting list for CISRS scaffolder training already building up. Initial courses will be delivered by experienced Simian Instructors Andy Sharp and Abid Gul, who will train and mentor local instructors until they are suitably qualified and experienced to deliver OSTS courses themselves. To find out more about CISRS OSTS, the new CISRS CPD courses, obtain a copy of the CISRS CAP 609 General Information Booklet, new cards poster or to find out more about CISRS, please visit www.cisrs.org.uk or email enquiries@cisrs.org.uk.